The Brits love an underdog. The Yanks love a winner. And Carole King was both. So it’s no wonder this biographical jukebox musical is shaping up to be a transatlantic smash, having already conquered Broadway. Hitting the big time aged just 16, gawky, self-effacing Brooklynite King went on to write a string of smashes for other artists during the ’50s and ’60s, before overcoming shyness and a failed marriage (to her writing partner Gerry Goffin) to strike out on her own with the world-conquering album ‘Tapestry’. It’s a heart-warming story, and Katie Brayben is winning in the extreme as the nerdy King. It’ll probably run for ever. Except maybe one sliiiight problem: it turns out Carole King’s life was really boring. Not, like, hideously boring. Probably marginally more exciting than, say, my life. But 'Beautiful' would suggest it wasn't that much more interesting. Douglas McGrath’s dialogue is charming and Marc Bruni’s direction light and zippy. But plot-wise 'Beautiful' is basically two-and-a-half hours of Carole sitting in an office, writing songs, with the occasional cut to her marriage failing apart, poignantly but affably. King and Goffin’s friends and songwriting peers Barry Mann and Cynthia Weil feature too; and certainly Ian McIntosh’s neurotic lothario Mann and Lorna Want’s spunky Weil add fun and colour. At the end of the day, though, making it a show about two sets of married couples working in an office doesn’t double the fun. Still, those songs, eh? ‘Some Kind of Wonderful’, ‘Take Good Care of My Baby’, ‘Will You Still Love Me Tomorrow?’, ‘The Loco-motion’, ‘You’ve Lost That Lovin’ Feeling’… these are not tunes anyone in their right mind is going to argue with. With cutaways to The Drifters, The Shirelles et al performing them, musically ‘Beautiful’ serves as an affectionate homage to the febrile high-water mark of rock ’n’ roll and teenybopper music in America. And it’s not totally toothless – there is some knowing mockery of the more vapid songs of the era (hello, Neil Sedaka). Brayben is a good actor, a nice singer – maybe a bit more Stevie Nicks than Carole King, but that's fine – and a sweet fulcrum to all the action. It’s hard not to root for her, as ‘Tapestry’ finally lets her quit that office job. But really, there’s not a lot here beyond the songs. This review is from the 2015 London premiere of 'Beautiful'. The cast of 'Beautiful' now includes Cassidy Janson as Carole King, following her roles in West End musicals 'Avenue Q' and 'Wicked'. How to get cheap tickets: a limited number of day seats for each night’s performance will go on sale at the Aldwych Theatre box office every morning from 10.30am, priced £39.50 each. In person only. "There's not a lot here beyond the songs" but that doesn't bother me at all. 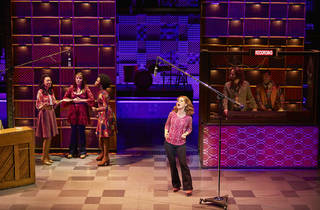 It's a musical that recognises and celebrates Carole King's music, as well as giving us the history behind it all. Managed to see the Broadway version, so I was excited to see this company's take on it. It's scary how accurate Brayben's portrayal of King is - there were so many times where I sat there and thought that it was really Carole King on stage - for me, Natural Woman was the real highlight, where Brayben really captured the essence of King to the smallest of details, whether it's the style of singing, the focus and the passion she expresses with the number... Truly impressive!! Want as Cynthia Weil was brilliant, an absolute joy to watch!! You couldn't help but smile when you see her on stage!! One minor issue with the production was the sound - sat in the middle of stalls, and i noticed on a few occasions the orchestra were slightly over-powering, covering the vocals, and for people that aren't familiar with the songs, it's easy for the lyrics to become a blur. Apart from that slight issue, with so many great songs performed by such wonderful actors, you'll find your feet tapping and fingers drumming throughout the whole production!!! A tired formulaic musical full of juvenile slapstick humour and limited character depth. A must see for die-hard fans (based on the standing ovation it received from the over 60s), but for the rest of us the musical feel rather flat. Carole King wasn't a name I was massively familiar with and didn't know much about this show other than the odd anecdote about it being good. Therefore I went with no real expectations and managed to get tickets for a cheap price. They were very high up and a little bit of a restricted view at times. However the show itself was really quite moving, I couldn't help but become caught up in Carole's life and really feel for her. I thought it was a story told really well and was amazed by the amount of Carole King songs I knew and therefore really enjoyed the soundtrack throughout. What a talented lady! This musical has been on my list to visit for what feels like years and after seeing it finished THIS WEEK I panic bought tickets. The seats were in an area I wouldn't normal choose as in at the top and yes it was steep and I was a little dizzy at first but once I got into the swing of it I forgot about the height and concentrated on the music. I didn't research anything in advance as I really wanted a surprise of what songs were in it plus also to see which ones I actually knew. I didn't need to worry at all as I pretty much knew every hit. The story line itself tells of how Carole King met her husband at 16 and got pregnant but they became musical partners composing and writing lyrics together for different artists and bands at the time. Jerry who is Carole's husband drifts away at times and the story develops into Carole finding her confidence to perform her own music live. The performance will make you laugh and sing but really embrace the songs with a new appreciation. I think I want to write songs now! I couldn't fault a single performance and the actor playing Carole was marvellous and to end on Beautiful really made the musical. It's going on tour so get yourself there! I'm currently checking out dates to take my parents. If you read this quick then you might catch it in London. Will you still love this tomorrow? The answer is yes, the back story of Carole King's rise to fame and the downfall of her marriage is played out beautifully, interjected with Carole's songs sung by artists such as The Drifters and The Shirelles. The story isn't the most interesting one in the West End, but this show more than makes up for it with the songs and funny script. Several songs gave me goosebumps, as I can remember them being played on my parents' radio when I was growing up. See this show before it closes on August 5th, you won't regret it! Until last year I'd never even heard of Carole King, my friend told me she was going to see her in Hyde Park and I asked who she was. I heard about this musical but didn't know much about it. I saw some cheap tickets come up and thought I'd give it a try. As it started I thought maybe I didn't know enough Carole King songs to enjoy, I was soon taken by surprise as they sang well known songs throughout the 60's by groups like The Drifters, The Shirelles and Aretha Franklin. As the strapline says I was almost dancing in the aisles. The songs were well performed and catchy, I was surprised by how many of them I actually knew. The story is the early years of Carole King's life, meeting her husband and writing songs together for some of the most famous groups of all time. Mixed in were a few songs from their in house competition Barry Mann and Cynthia Well. The musical was very loveable and I enjoyed every moment and Cassidy Jones put a wholehearted and convincing performance, I could of believed she really was Carole King. Go see it before it finishes in the West End's Aldwych Theatre in August. This is one of the best musicals I've ever seen. I am a massive Carole King fan and it only made me love and respect her more. This is a really inspiring show, and is beautifully performed. As a regular theatre goer, I have to say this is one of the best productions I have seen in a long time. I laughed, I cried and was lost in every word for 2 hours. The cast were outstanding. I really liked the story of Carol King and her early years. I loved her music and never realised how many songs that she and her first husband actually wrote and made hits from. 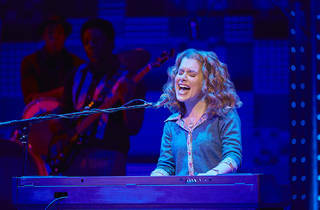 It was an absolutely brilliant show, and one I would highly recommend whether your a fan of Carole King or not. I would definitely go and see this show again. What a treat of a musical- this is the perfect night out if you’re looking for a cute storyline, songs to fall in love with and a general feel good atmosphere that will linger in your memory long after you’ve left the theatre. Featuring a range of old favourites from Carole King ('So far away', 'You make me feel' or ‘Beautiful'), this musical will also surprise you with many songs you did not expect to hear and which you probably didn’t know were written by Carole. Think ‘Will you still love me tomorrow’, a heartfelt song, made famous by the Shirelles and reinvented by Amy Winehouse or Little Eva’s old time classic ‘Locomotion.’ Blended skilfully into the music, you’ll find a coming of age story to remember, with a hint of romance, friendship, dreams, disappointment and hope. 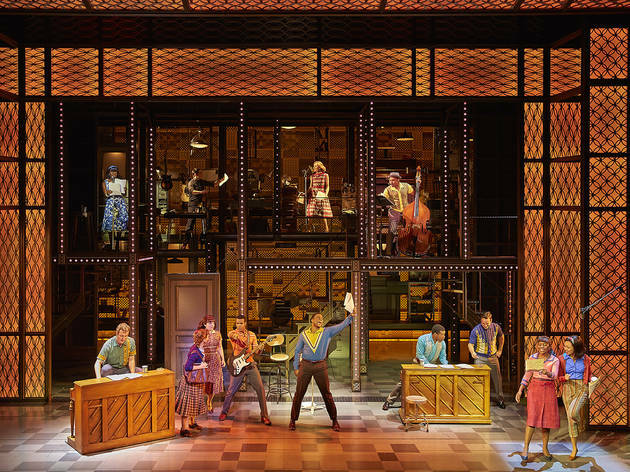 ‘Beautiful’ certainly lives up to its name and unlike a moment's pleasure (the dwindling love in of one Carole’s songs), this musical is bound to be a lasting treasure. Wow, what a show! An absolutely fantastic production taking you through the early days of Carole king and the trials and tribulations she went to for stardom. It wasn't an easy journey for her. I had no idea I would recognise so many songs and the whole audience was dancing on their feet by the end of the show. A real feel good show and suitable for all ages. I was actually pretty impressed by this musical! I think I might a bit young to appreciate the similarities with the real Carole King but if you take the story line out of context, this show is telling you the story of a very talented Brooklyn girl starting by writing songs only with her partner and ending up at the top of the charts with her own album and songs written and sung by herslef! Despite my lack of knowledge on the real Carole King, I really enjoyed the music and the sets. I also thought this musical was very empowering! One of my favourite musicals in London right now. I laughed, cried, danced and sung. I didn't realised that Carole King had written so many of the 60s and 70s hit songs. 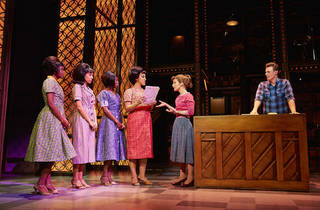 A musical about the true life story of Carole King. A journey from her early childhood, the relationship with her mother, her dreams, her marriage, her friends, her talent and her astonishing career. Some songs are well known even today but most of them will seem too old-fashioned to your ears.The story refers back to 60’s, 70's, 80’s. Nice musical but I would say mostly for your parents or grandparents which I think they will adore. Not to forget; excellent lighting for musical. I'm in total awe of Carol King after seeing this musical. The story of her life really touched my heart in every way imaginable, it was done so beautifully. If you don't know much about Carol King, like I was prior to seeing the musical, you'll be so shocked at how many songs you know and had no idea Carol composed. Every song performed was incredible and made you feel like you were back in the 60s. I cannot write a review without mentioning Katie Brayben, who currently plays Carol, her voice just took my breath away. You'll totally get why she won the Olivier award for best actress in a musical! I'd recommend anyone who loves music from the 60s to go see this, it's also definitely a good one to treat the parents to. Straight off the bat, Beautiful, The Carole King Musical is one of my favourite West End show right now. The musical is an absolute rollercoaster. 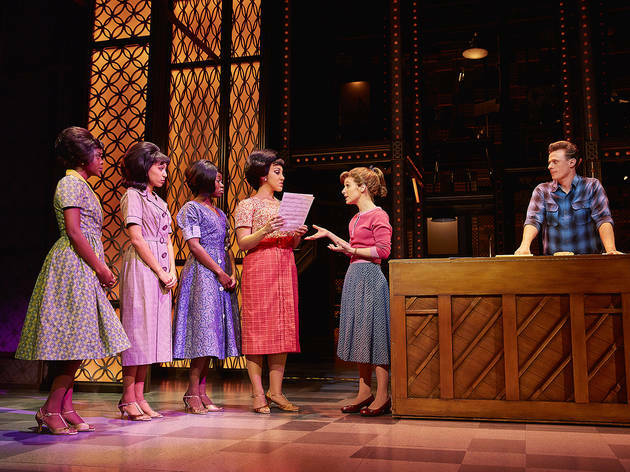 An ordinary girl with an extraordinary talent, Beautiful: The Carole King Musical is the inspiring true story of Carole King’s from small town girl to stardom. It’s a story how Carole King fought her her way into the industry as an innocent 16-year-old, marrying the husband of her dreams, her flourishing career, her relationship with her best friends, the breakdown of her personal life and her re-emergence as a star in her own right. I don’t know about you but I’ve always had a thing for the 60’s to 80’s. The stage set and costume did an incredible job of reflecting the style and trend of those eras which I find fascinating. Needless to say, the acting on stage was world-class as you’d expect from any London West End production. A special mention should go to Cassidy Janson (Carole King) who seamlessly portrayed the great sing-songwriter from a young aspiring teenager in the 1950’s to the star she later became in the 70’s. Cassidy was astounding with her incredible vocals, likeability and acting prowess. For the younger audience, you may not have heard of Carole King but you will definitely have heard her music. They are timeless classics which are often covered or fronted by other artists. It’s hit-songs after hit-songs. Just Youtube “It’s Too Late” or “A natural Woman” to get a flavour. Long after the show had ended, I still found myself humming the tunes. It’s that good. For those who listened to Carole King back in the days, this will be a good dose of the good old times. 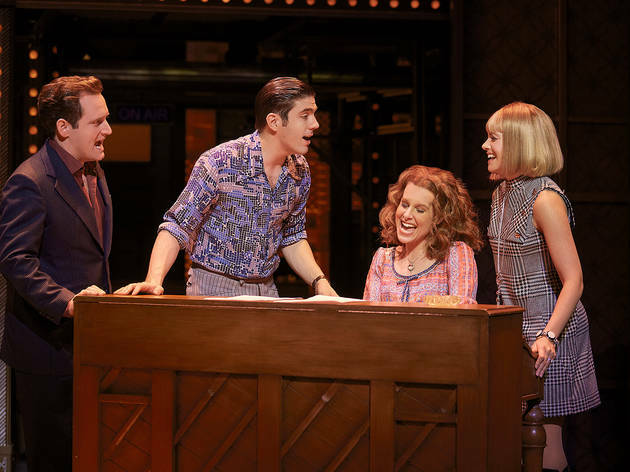 Slick, tuneful and beautiful, Carole King Musical is so much more than some kind of Wonderful and one of those shows you have to see in the West End. The musical that takes you on Carol kings journey from a giggling school girl to an accomplished artist. Share in her successes, relationship and broken marriage as her journey takes her from writer to artist. Watch out for the journey back in time with some of the largest Motown stars as the suddenly appear on stage. A fantastic feel good production. It was Beautiful with soulful classics, ballads and impeccable vocals. I had the pleasure of seeing the first London cast in this show in the summer of 2015, and I fell in love. Let's be honest - it's not hard to enjoy the music of Carole King. I've got Tapestry on vinyl in heavy rotation in my flat. But to have these songs - and so many other songs she wrote for so many other artists - interpreted in such a way is fantastic. You might think the vulnerability of some of her pieces would be lost in such grand scope, but quite the contrary. Katie Brayden did immense justice to the role and brought humility and strength to each performance. The rest of the cast were knockouts in their own right. I loved learning about how the songwriting moved through the stages of King's life and how each of the people that came into her presence had some sort of effect. 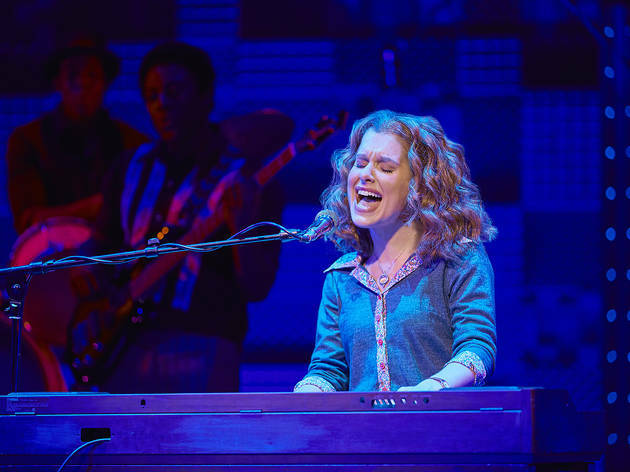 The show culminates in Carole King's performance at Carnegie Hall in 1971 and by then you've heard a fantastic career-spanning selection of songs and experienced stellar performances by the cast. See it - you will NOT be disappointed. Really lovely show, intriguing and interesting story, great relationships and friendships, and wonderful music. A really must see musical! 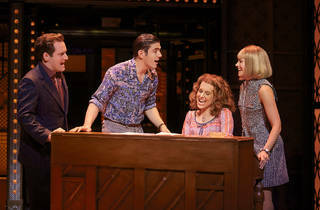 As a huge fan of Carole King, I would have been perfectly content with seeing, as this review describes, a production which thrived solely because of the music. Personally, however, I found the storyline to be engaging, innovative and beautifully written. Katie Brayben is phenomenally talented and wonderfully captures Carole King's essence without performing an outright imitation. I have been singing this production's praises to anyone who will listen and would my highly recommend it for everything it has to offer including outstanding performances from the whole cast and a touching storyline. A must see for anyone who is a fan of King, Goffin, Mann or Weil or, more generally, music from or the aesthetic of the sixties. As a massive musical fan, I knew I would enjoy Beautiful (there are few musicals that don't send shivers down my spine), but Beautiful was a huge, pleasant surprise for me. Whether you are an avid Carole King fan or know nothing about her (I guarantee you will know most of her songs), Beautiful is a great production and am sure it will be celebrating many more birthdays on the West End to come. Cassidy Janson as Carole King is fantastic. Her vocals are amazing and when she sings Natural Woman, it is a showstopper moment. Her ability to portray Carole as a big dreamer teenager, to a heartbroken mother as believable and likeable is brilliant to watch. But just as impressive is Lorna Want who plays Cynthia Weil, who brings great humour and witty timing to the show. The show is slick and the calibre of performers make it a real stand-out show. The amount of hits that you have heard of, even if you had never heard of Carole King before, mean every number is enjoyable. The story is intertwined with the music well so even though it is jukebox musical, you remember the story and characters just as much as the tunes once you leave the theatre. Beautiful is a joy, full of life and colour and brilliant performers. It is up there with some of the musicals which have been housed on the West End for years, so make sure you go and learn more about the fascinating songstress. 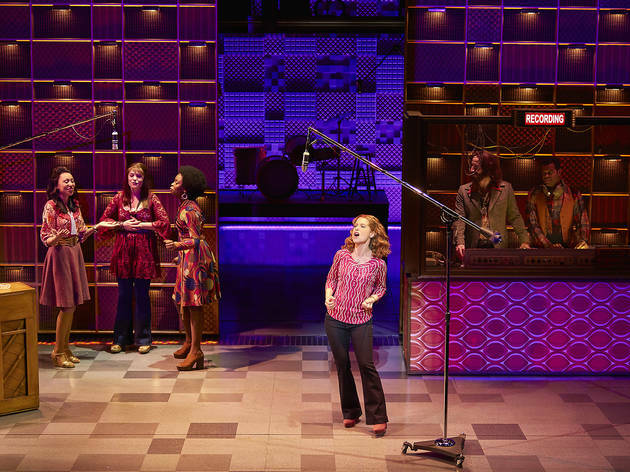 Yes, its audience is full of grey-haired baby boomers singing along to the 1960s songs and crying over their lost youth, but this musical is just plain fun. There's no real depth to the characters, and the jokes and dialogue are simplistic, but the performance of Cassidy Janson as Carol King is energetic and engaging (and her voice is much better than that of the woman she portrays). As an American, I did flinch at some of the actors' attempts to sound like they came from Brooklyn, but their vocal performances made up for it (and what a voice Lorna Want, playing Cynthia Weil, has). My mum and I went for my birthday and had a great time. You'll recognise a lot of the songs and not even realise there was a connection to Carole King. 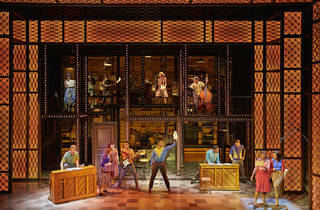 The musical tells the story of Carole's love life set to her most popular hits. It's a really great show, although the theatre did get rather stuffy so wear layers. This is an amazing show. Every song is a classic & even though it's a "jukebox musical" the narrative flows & doesn't feel forced. Carole King has an incredible life story and a faultless back catalogue. Cassidy Janson puts in the performance of a lifetime as our leading lady & right from the very first song I was swept up by the casts talent & energy. The sets are fantastic & it's a polished show with slick choreography. It's funny, heart breaking in places & ultimately uplifting as a major talent finds her voice & fulfils her potential. Everyone will love this show! I took my mum to go and see Beautiful and we both loved it. It is laid-back, fun and irresistibly infectious – I haven’t stopped listening to the soundtrack since! Like most musicals, it was bright, bubbly, easy to follow and the perfect mother-daughter treat! Unfortunately, if you are sat right at the back of the stalls though, the dress circle blocks some of the stage but still great value for what I paid. I really didn't expect to love this show as much as I did. Great performances, high energy, well paced. Can't wait to see it again! This is a new favourite musical for me, I could watch it again and again. I was expecting a jukebox musical but it really is so much more than that. The sheer amount of songs she and her husband wrote which were smash hits amazed me. I knew every single song but before going I wasn't even that sure who Carol King was. Katie Brayben is supremely talented, charming and endearing as Carol. The character is light, funny and warm but when pushed to the edge by her husband her ballsy side shines through. Her parting speech with him had not only myself but other women in the audience loudly agreeing she had put up with more than enough of his selfish cheating ways. When singing 'Natural Woman' the emotion pouring out of her voice was intense and incredible. She is leaving the musical soon so I urge you to go and see it as soon as you can. It’s surprising how any of the songs you recognise and what variety of styles Carole King has - she is an awesome composer, lyricist and singer. The story is mostly feel good, but is also sometimes poignant. This is a great show with an absolutely amazing cast and is one to watch. I loved this show. Right from the onsite, launching into a song as soon as the curtain went up, you knew this was going to be upbeat, vibrant and full of great tunes. I went with my mum and had to ask her a lot about some of the characters - as they were big in the 60s and 70s, however there wasn't a track I didn't recognise. I also had quite a few (perhaps embarassing?) moments when I realised that the song I recognised was not by an 80s or 90s singer as I'd thought...but far older than that. I loved the loved story, they heart-ache and the humour. It was great seeing how the industry worked back in the day when song writers were employed and revered. The songs, it goes without saying, were amazing and performed with gusto and talent. But for me, this wasn't just a concert, there really was a great story and one told very well. Really, really enjoyed this. Took my Mum for her birthday and we both thought it was great, so it appeals to a range of ages. I was surprised at the number of songs I knew and loved, and that the same duo were behind them all. Incredible! This story is an emotional journey: heart warming, saddening, emotional, uplifting and empowering. A wonderful way to spend an evening and I would absolutely go again. Be prepared to hum the tunes all the way home! For any fans of Carol King’s music this show is a must see! I was hoping to see it on Broadway last year but ran out of time. Although I’m probably not the target age group, I enjoyed the musical because it gave us the story of Carol’s life and reintroduced me to some songs I didn’t even know she wrote e.g. Locomotion. Katie Brayben who plays Carol actually went to my school so without trying to sound bias I felt she did a great job as Carol! This is one of those musicals that surprises and delights. I wasn't even a huge Carole King fan but the music, the story and above all the sheer quality of the acting and choreography totally won me over. It's one of those that will have you singing for days. Brilliant. Really enjoyed this one. Had no expectations about it really and had an amazing time with my partner. I would def recommend it as a great alternative to the most famous musicals. This show was outstanding. Great music beautifully performed and built around the story of the making of the song writing and recording career of the wonderful Carole King. So many grewt songs, some we know of and others we never knew she wrote. Recommended to any baby boomer out there who has loved her songs for all these years. Warning: you will want to sing along - an impulse best resisted! Katie Brayben was fabulous and yes it's a bit formulaic but it is a celebration of great song writing and singing. Will there be a show about One Direction in 40 years time? A thoroughly enjoyable evening! OK , so I am the target audience. I have a copy of Tapestry on vinyl that carries the scratches of my youth. However, what happened tonight at The Aldwych Theatre seemed to bring the whole place to a remarkable high. Beautiful is a musical so aptly named. In truth it’s another juke box storyline, like Jersey Boys or Sunny Afternoon. The difference is the quality of the lead. Katie Brayben- is simply outstanding. She delivers the songs of Carol King with an authenticity that left me breathless. Hers is a five star performance in a three to four star show. The seven star finale tonight saw Carol King take to the stage to thank the whole cast and crew, then lead the audience in a chorus of You’ve Got a Friend. Carol – you have so many and this show will make you more. Beautiful. I loved Beautiful. I was so excited we got the Broadway transfer.. I hope we sent them something equally fun! The storyline was great. The song and dance numbers were polished. Do we clap after a big song in the theatre? I just went along with everybody. We had a hummer/singer down the row from us...So that was bad but didn't detract too much. I had a great night. The cheap seats in the upper circle were fine... Just go and see it. It's great! It's my 8th theatre visit in 2015. I think it stands out along with Sunny Afternoon.